The deformation behavior of pure copper was studied in hot compression tests in the temperature range of 773–1173 K and strain rate interval of 0.001–1.0 s–1, the corresponding flow stress curves were plotted. 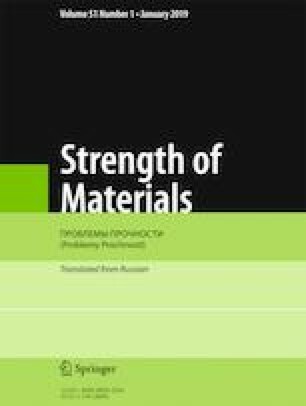 The new method to calculate critical and saturation stresses was devised, quantitative analysis of strain hardening and dynamic softening was presented, a three-stage constitutive model was constructed to predict the flow stress of pure copper. As predicted and measured flow stress comparison indicate, the physical constitutive model can accurately characterize hot deformation of pure copper. With dynamic recovery and/or recrystallization. Numerical simulation of an upsetting process is carried out by implementing the constitutive model into commercial software. This model can be put to practical use and be quite promising for improving efficiency of a hot forging process for pure copper components. Translated from Problemy Prochnosti, No. 1, pp. 127 – 136, January – February, 2019. This research is funded by Chongqing Research Program of Basic Research and Frontier Technology (No. CSTC2015JCYJBX0115).